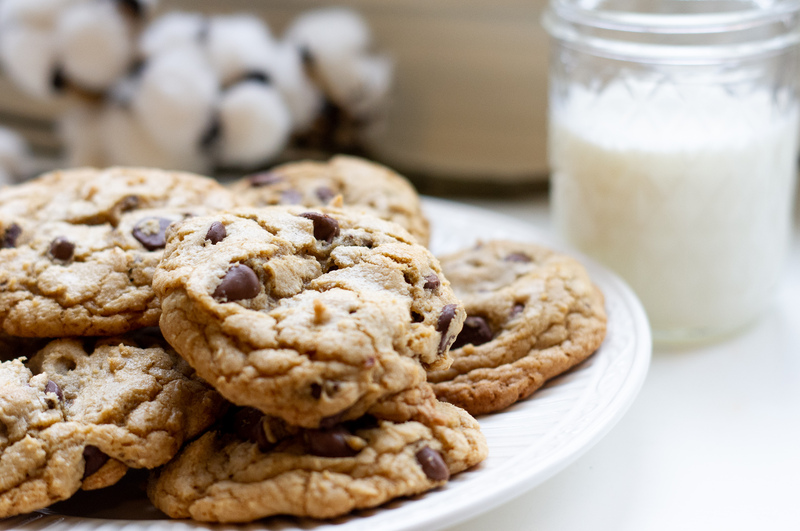 My favorite type of dessert to bake has to be a classic chocolate chip cookie. There’s nothing like the classic chocolate chip cookie. Reminiscent of childhood memories and countless family gatherings. In my opinion, it is an essential recipe that everyone should have! The problem I had was that most of the time my chocolate chip cookies lacked flavor, or were too thick or thin and were just disappointing. So a couple of years ago I started testing out recipes from various places and I finally have a recipe that our family loves and that has never failed us. I love this recipe because it is simple and straightforward. These chocolate chip cookies are also unlike any other I’ve had or made because they are FULL of flavor, which comes from browning the butter before making the cookies. Browning the butter also results in a chewy texture instead of a more cake-like texture. One of the great things about baking these cookies is that you don’t even need to pull out your stand mixer or hand mixer. You can whip these up and have some delicious cookies very quickly. Keep an eye on that butter! Once the butter gets hot enough it will brown quickly and you don’t want burned butter. Don’t overbake! I would start with the suggested time for your first tray and then let them cool. Test and see how they cooked and then adjust the time for your oven and area. Use a cookie scoop to get perfectly even cookies that cook the same. 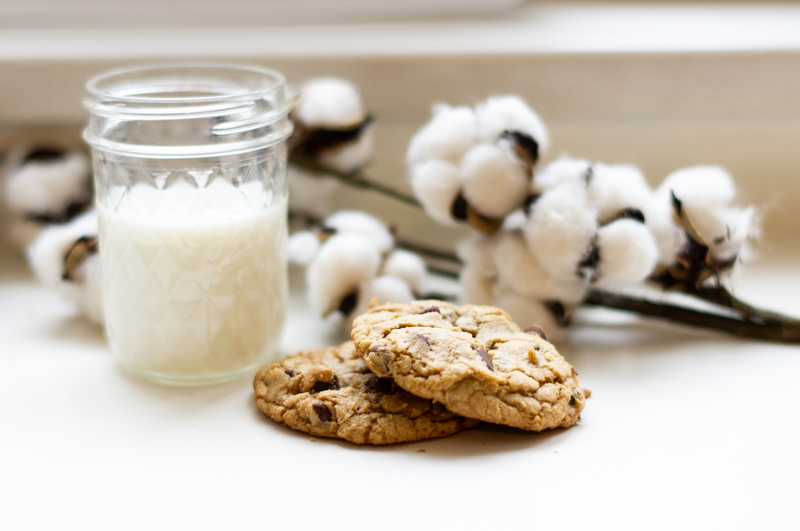 We’ve been making these classic chocolate chip cookies now for a long time and they really are amazing. I hope that you give them a try and if you do let me know what you think on Instagram with the hashtag #SNChocolateChipCookies. Separate the butter into 10 tablespoons and 4 tablespoon pieces. Cut the butter into small pieces so that it can melt faster. Set the 4 tablespoons aside. Whisk the flour and baking soda together in a medium bowl; set aside. Heat the 10 tablespoons of butter in a medium skillet over medium-high heat until melted. Once the butter is melted, continuously swirl the pan until the butter is browned and has a nutty aroma. This should take around 1 to 2 minutes. Keep an eye on the butter it turns brown really quick! Transfer the browned butter to a large glass bowl. Add the remaining 4 tablespoons butter and stir until completely melted. Add the sugars, salt, and vanilla and whisk to combine. Set a timer for 3 minutes and 30 seconds. Add the egg and egg yolk and start the timer. Whisk for the first 30 seconds and then let the mixture sit for 3 minutes. Repeat this process two times. Fold in the flour mixture and gently stir until no flour lumps are visible. Divide dough into balls, about 3 tablespoons. *See my note about cookie scoops below. Place them on the prepared cookie sheets. Bake for 10 minutes, one baking sheet at a time in the preheated oven, until edges are golden brown and cookies have just started to set. Rotate the baking sheet halfway through the cooking time. Allow to cool slightly, then transfer the cookies to a wire rack to cool completely. I recommend using a stainless steel pan to brown the butter in. This way you can see when the butter is starting to brown. If you only have a non-stick skillet, just keep a very close eye on the butter as it will be harder to see when the butter turns brown. The whisking and resting process is really important to develop the flavor of the cookies, get the right consistency, and allow the sugars to dissolve completely. I use two cookie scoops for this recipe depending on what size of cookie I want. These cookies can be made, shaped into balls and then frozen. Bake following the instructions from step 11 at 375 degrees, after the dough, has thawed for around 10 minutes.